An ambitious 2018 is ahead at French Guiana’s Spaceport as preparations intensify for Arianespace’s initial Ariane 5 and Soyuz missions of 2018, which will set the stage for up to 14 flights this year that involves their various launchers. The Ariane 5 mission, designated Flight VA241 in Arianespace’s numbering system, will deliver the SES-14 and Al Yah 3 satellites to geostationary transfer orbit on January 25. Its heavy-lift vehicle (delivered by ArianeGroup as production prime contractor) currently is inside the Spaceport’s Final Assembly Building, having been transferred from the Launcher Integration Building atop a mobile launch table earlier in the week. With Ariane 5 in position at the Final Assembly Building, the launcher is ready to receive its two satellite passengers, which have undergone their own pre-flight preparations inside the Spaceport’s S5 payload processing facility. The forthcoming integration activity will be followed by final verifications and subsequent rollout to the ELA-3 complex for liftoff. 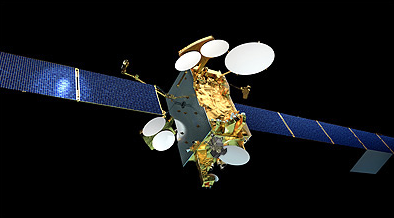 Arianespace is orbiting SES-14 for Luxembourg-based telecommunications satellite operator SES. The spacecraft will serve Latin America, the Caribbean, North America and the North Atlantic region with its C- and Ku-band wide beam coverage, as well as Ku-band high-throughput spot beams coverage. It was produced by Airbus. Al Yah 3 is shown during preparations in the Spaceport’s S5 payload processing facility. Flight VA241’s Al Yah 3 passenger will be operated by Al Yah Satellite Communications Company PrJSC, which is located in the United Arab Emirates at Abu Dhabi. Once in orbit, the Orbital ATK-built, all-Ka-band spacecraft will provide affordable broadband communications to 60 percent of Africa’s population and more than 95 percent of Brazil’s population. As key progress is made for Ariane 5’s year-opening mission, French Guiana also welcomed two of the four passengers for Arianespace’s first Soyuz mission in 2018, Flight VS18, scheduled for a March liftoff from the Spaceport. These spacecraft, which will further expand the SES-owned O3b satellite constellation, were airlifted yesterday to Félix Eboué Airport near Cayenne and eventually will be joined by an identical pair, to be delivered later in January. SES’ O3b network offers a system that combines the reach of satellite with the speed of fiber, providing customers with affordable, low-latency, high-bandwidth connectivity. The constellation is fully-scalable to meet market demand and operates from a medium-orbit altitude of 8,062 km. 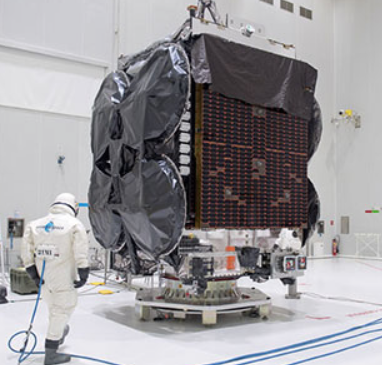 All O3b spacecraft have been designed, integrated and tested by Thales Alenia Space. The first 12 O3b satellites were successfully orbited by three Soyuz vehicles operating from the Guiana Space Center in 2013 and 2014. Each satellite weighs about 700 kg. at launch and provides more than 10 Gbps of capacity. Arianespace is planning for as many as 14 missions with its full launcher family in 2018 that includes up to seven flights with the heavy-lift Ariane 5, up to four using the medium-lift Soyuz and up to three to be performed by the light-lift Vega.